Retinal detachment is a serious condition that impacts a person’s vision. Retinal detachment occurs when the retina pulls away from the tissues around it, leaving the retina separated from other tissues in the eye. The retina processes light and sends visual messages to the brain that allow images to be created. If retinal detachment occurs, this process is disrupted and vision is negatively affected. The experienced doctors at Retina Associates are happy to discuss retinal detachment risks with our Kansas City, MO patients, as well as provide information about treatment options that can repair and restore function. The most serious risk of retinal detachment is permanent vision loss. 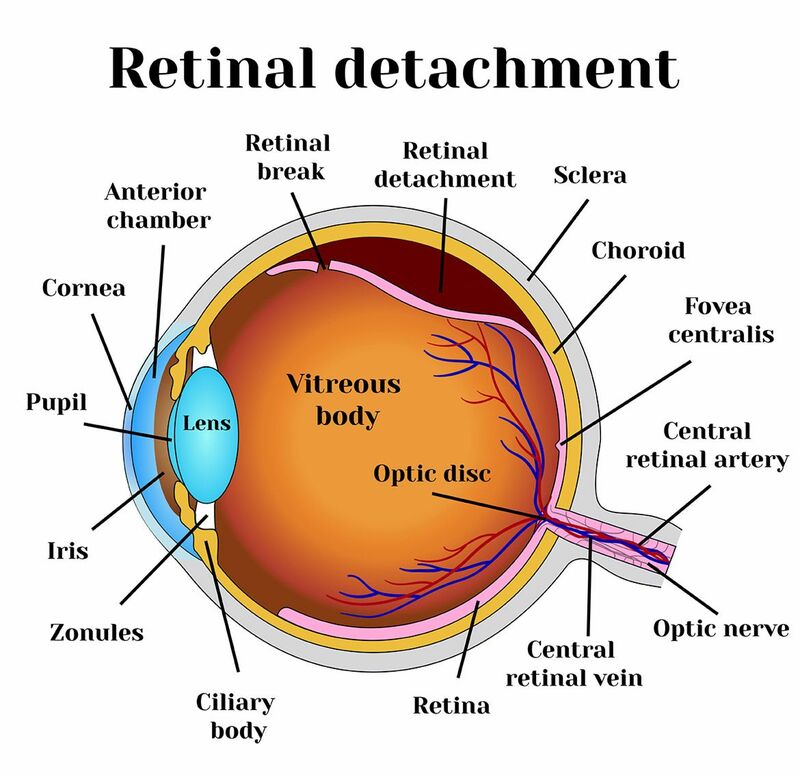 Retinal detachment greatly affects the function of eyes and the ability for images to be processed. When retinal detachment first occurs, a person is likely to notice subtle changes in their vision. The most common symptoms of retinal detachment include the appearance of flashes and floaters and a darkening of the peripheral vision (often described as tunnel vision). Any of these symptoms should be immediately reported to an experienced eye doctor, such as those at Retina Associates, so that the eye can be thoroughly examined and any complications can be diagnosed. As with most eye conditions, retinal detachment is a progressive condition that can quickly deteriorate a person’s vision. If retinal detachment is not treated right away, there is a real risk that vision will be lost permanently. The sooner that retinal detachment is diagnosed and treated, the more likely it is that the condition can be repaired so that vision is preserved. Age: Although retinal detachment can develop at any age, the risk of this condition increases significantly after a person has reached the age of 40. Nearsightedness: People who suffer from nearsightedness (particularly those with extreme nearsightedness) are more at risk for retinal detachment than those with other forms of vision impairment. Family history: Just as with many other eye conditions, it is believed that there may be a genetic link to retinal detachment. Patients who have a family history of retinal detachment are more likely to suffer from this condition themselves. Past eye injuries or diseases: Evidence shows that a history of eye complications increases the risk of retinal detachment. Individuals who have had an eye injury, been diagnosed with certain eye diseases, or undergone cataract surgery are more susceptible to retinal detachment. Retinal detachment does carry a very real risk of permanent vision loss. However, with early intervention, vision can be preserved. The best way to avoid permanent damage from retinal detachment is through regular eye care exams. This is an especially beneficial tool for those who are at higher risk for developing retinal detachment. If symptoms do develop, or retinal detachment is detected at a routine eye exam, it is important to seek treatment right away. Our doctors can discuss retinal detachment treatment options with those patients who are in need of care. Whether you have noticed a change in your vision or are simply in need of a routine eye exam, the experienced team of eye doctors at Retina Associates can help. Schedule an appointment at your earliest convenience to learn more about our comprehensive range of eye care services. We look forward to hearing from you!